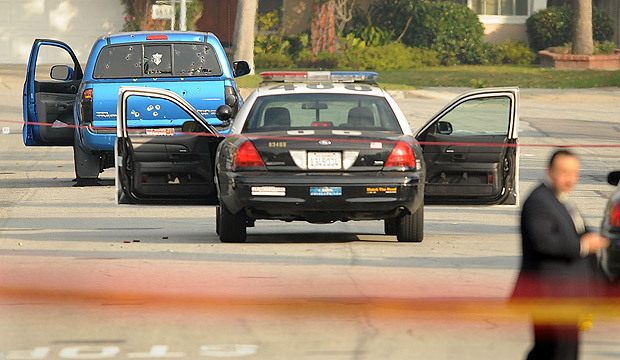 “Two women who were shot by Los Angeles police in Torrance early Thursday during a massive manhunt for an ex-LAPD officer were delivering newspapers, sources said.” One of the victims was shot in her hand, which was likely raised; the other in the back, classic. Riddle the vehicle with bullets first; find out whether you got the stocky black male suspect or a couple of innocent women later. Did they even think to run a check on the vehicle’s tag first, or are they really that stupid? Was the tag legitimate? Did the passenger(s) even remotely resemble the suspect’s description? Did the tip come from a legitimate source? LAPD wants this guy dead so bad that they are behaving like rabid dogs; corybantic, crazed, demented, desperate, enraged, fierce, and fit to be tied. Hundreds of LA cops have taken to the streets and hills armed with assault weapons and God knows what else, this time in search of one of their own. Does it really take hundreds of cops to find one suspect? Not hardly. That is unless 90% of the populace is on his side. Has the LAPD ever heard of intelligence? Are they unfamiliar with the word, investigation? How much intelligence went into riddling the first blue truck spotted, more or less matching the suspect’s vehicle description, with 33 bullets injuring two innocent news delivery women? What about the guy in the following video? Man Mistaken For Manhunt Suspect. One wrong move and he would have been dead. Some anonymous informant called the police and said, “He’s right here, sitting in the parking lot,” and LAPD raced over threatening the very life of a stocky baldheaded black man. This guy is lucky to still be breathing. If you look anything like the suspect, you better get the hell out of Southern California, and even if you’re not anywhere near Los Angeles, and there’s no resemblance whatsoever, your safety is in jeopardy. This madness has to stop before dozens of innocents are injured or murdered. The national media has just created a mass panic and now every bald stocky black man in America is a suspect. Hey, don’t take this lightly, they’re already saying that the rogue cop could be anywhere, aren’t they? He could have been in my office this morning. He could be any bald stocky black man attempting to board a bus, train, plane, or embarking on a cross-country drive. Since he’s not really a public threat, but just a thorn in the side of what for all we know is a corrupt police force, maybe it’s time for the Feds to step in and begin conducting a proper investigation. I would like to see this guy given the opportunity to turn himself in, and receive a fair trial. If he did what they say he did, he should take the rap and do the time. And likewise, if the officers he named in his manifesto are guilty of what he accuses, they should also take the rap and do time. At this point, we really don’t know victim from villain. If the suspect dies, we may never know the truth. The public should be less afraid of the suspect than those conducting the massive manhunt. At this point, I’m less afraid of Dorner than the LAPD. The real threat is allowing hundreds of cops to menace the countryside, armed with assault weapons, ready to riddle any bald stocky black man, or anyone else for that matter, with as many bullets as possible. It kind of makes the concept of a national gun control policy nothing but a ruse. You want to take away the rights of law abiding citizens, while government law enforcement officers are left virtually unchecked? No, that’s not how this works. LAPD should get a clue. You’ve just taken the bait, hook line and sinker. You’re guilty of exactly what your former associate and accuser states: running around like you own the world, bullying, racial profiling, using the N-word, and pointing guns at and shooting innocents; instilling fear in the public you’re supposed to serve. I have much respect for cops who know their role and uphold the law and the Constitution, but I hold in contempt any sorry mutt who races to a scene and unloads his/her weapon without so much as a thread of evidence. Perhaps it’s time for the LAPD to clean house. I strongly agree with you on this one. The police should not create new victims in their pursuit of a mad man.